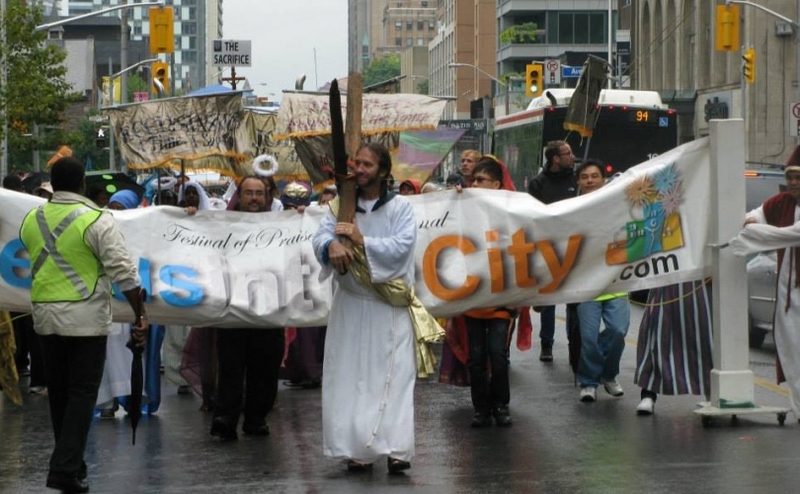 TORONTO – Toronto’s Jesus Parade is back on, says its chief promoter Charles McVety of Canada Christian College, but city officials say there are several hurdles that could be show-stoppers if not overcome. Organizers of the Jesus in the City parade, which could draw as many as 10,000 Christians, many dressed in Biblical costumes, to Toronto’s downtown streets on September 6, got word a week ago their request for permits from the city’s transportation and police departments had been declined. McVety went public, accused the city of persecuting Christians, then got Mayor Rob Ford to urge city officials to co-operate. McVety is now claiming success. “We are optimistic the parade is going to happen Sept. 6 as originally scheduled,” he told the Toronto Sun. “There are still some i’s to be dotted and t’s to be crossed but the parade is back on with an alternative route,” McVety said. That route will now begin on Rosedale Valley Rd., follow Church and Bay Streets and end at Queen’s Park. “We have so many people coming in from out of town and others who have built floats that we are grateful this has been resolved,” said McVety. The original problem was the competition for city services from other events —University of Toronto’s Orientation Week, the Toronto Film Festival and extra buses running through the area ferrying passengers across a break in the subway line. Those events are still there, still requiring either extra police officers to open and close streets, or barricades, or both. It is not clear that there are enough. McVety says the city was not willing to look for an alterative route until Mayor Ford intervened. But at a subsequent meeting between McVety’s planning team and the city, an alternative was worked out. Parade planners abandoned their wish for the event to start at Queen’s Park, and for a festival with booths and displays set up at Queen’s Park throughout the parade. Now the march will end at the edge of the park and start elsewhere, much reducing space demands on Queen’s Park Crescent, which is already crowded with construction equipment and cordoned-off work areas. Ford, deep into a re-election bid that was given little chance because of his much-publicized problems with drug and alcohol abuse, has recently narrowed the lead enjoyed by frontrunner John Tory to a few percentage points.